Seeds that would become St. Paul’s began to germinate in the 1880s when Catholic students and other Roman Catholics at the University of Wisconsin began to meet regularly in people’s homes. They sought spiritual and social company as they dealt with a university, then as now, that was hardly sympathetic to their religion or its practitioners. In the first decade of the twentieth century they found a priestly ally in Fr. Henry Hengell, first pastor of St. Paul’s (1906-1936). It was he and a group of committed students who gained permission to establish St. Paul’s University Catholic Center at 723 State Street and who oversaw the completion of the first chapel on the site in 1909. From the first, the church was intended to be a home, and sometimes a refuge, for interested Roman Catholic students. Though university staff and community residents could also attend, the church was to be for students. Over the years St. Paul’s prospered as a religious and social center for many Roman Catholic students. Under Pastor Alvin Kutchera (1936-1960), for whom our library is named, St. Paul’s was successful in connecting with many campus Catholics. Fr. Kutchera’s diminutive figure was fondly regarded by several generations of Catholic students for whom he embodied their faith. The 1960s brought the changes of Vatican II to the Roman Catholic Church and to St. Paul’s. For example, the mass went from Latin to English and the priest faced toward the people rather than away from them as he celebrated the Eucharist. St. Paul’s under the charismatic pastor of the age, Fr. Henry McMurrough (1967-1975), saw the completion of its new church in 1968, the “brutalist modern” structure of today. It was meant to be an expression of the new spirit, sweeping away the traditional church. Larger than the old church, it was also a response to the greatly expanded attendance at St. Paul’s in the 1960s. In that era and for a time after, no fewer than eleven masses were celebrated by four full-time priests. General excitement about the reborn Roman Catholicism was in the air, and St. Paul’s became known as the place to be for liberal Roman Catholics for miles around. Many students also attended, but more and more, St. Paul’s was a community church filled with nonstudents, and an increasingly active lay group was involved in its operations. Also important in the 1960s and 1970s were the impact of the Vietnam War and the civil rights struggles that led to riots and the presence of the National Guard on campus. These movements necessarily swept up many at St. Paul’s, and it became a willing home for social activists and political dissidents of several hues. The 1970s also saw St. Paul’s hire a woman chaplain, the first of whom was Jane Redmont. In these years and throughout the 1980s, St. Paul’s was a place where many Catholic feminists felt at home. From 1980 to 1990 under the pastorship of Fr. Steve Umhoefer, St. Paul’s obtained a certain stability. 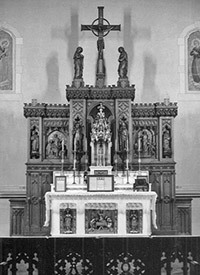 During the 1990s under pressure from the Bishop of Madison and, increasingly, from students and others within St. Paul’s, the church edged more and more toward a liturgy in conformity with the rubrics and toward focusing on students once again as its primary mission. Fr. Steve Kortendick (Pastor 1996-2002), working with able chaplain Faye Darnall, innovated in creating and fostering student leadership and programs with great impact. Fr. Randy Timmerman, Fr. Kortendick’s successor, firmly reestablished St. Paul’s as a student church, which his popularity with students reinforced. Today St. Paul’s is a bustling church with dedicated priests, staff, and many volunteers. It is student-oriented, though others are welcome, and is happily taking its inspirations from the Holy Father. It is once again a world that its founder, Fr. Hengell, would recognize and respect.